Gauge: Not crucial for this project, however I always try to crochet tight when I am making a piece that will be stuffed with fiber fill. Note: you will be working in a continuous round to achieve a seamless look, do NOT join unless specified. Stuff your piece lightly with polyester fiber fill. Fasten off, leaving a long tail of yarn. Sew the top shut with the yarn needle and weave in the ends. Attach the tail using safety pins. 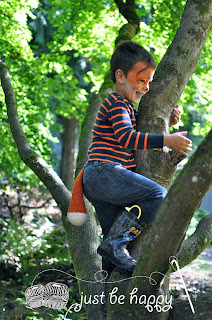 Now go on a nature walk and explore the "wilderness" with your very own little fox!